The Ancestry Archive is our database of family trees, which contains almost 400 million names. The files contained in the archive represent the individual research of thousands of family historians. Finding an ancestor in the Ancestry Archive can not only help you extend your family tree, but also contact other researchers who are working on the same family lines. When you complete a search in the Ancestry Archive, you can also search our extracted records database. All together, you will search more than half a billion records at once. On the advanced search screen, you can choose to search all of these records at once, only our collection of family trees (by selecting the "Do NOT search Extracted records" option), or you can select a specific volume to search from the "Select Database Volume" scroll box. Our collection of family trees is broken down into volumes according to the year each tree was submitted to us. So, if you wanted to search only for family trees that have been submitted recently, you could select the current year from the volume scroll box. You can also select the Extracted volume, which includes all of our extracted record collections, or the Online volume, which includes a collection of links to family trees found elsewhere on the web. First Name (optional) - The "First Name" field is optional. You can leave it blank if you wish to search on a last name only. You can also enter a partial first name to see all results that begin with those letters. For example, if you enter Rob into the "First Name" field, you could see results for Rob, Robbie, or Robert. This may be useful if you are searching for an individual who may have used various forms of his or her name or whose name may have been spelled in different ways (such as Francis or Frances). Last Name (required) - You must enter a last name to complete your search. It is possible to search on more than one spelling of a last name at the same time by entering the names separated by a comma. For example, you could enter "White,Whyte." Event Type (required) - The event option allows you to select for what event in your ancestor's life you are seeking information. The options are when your ancestor was Born, Married, or Died. This option is set to Born by default, so you will need to change it if you are seeking for information about a marriage or death. Year (required) - You must enter a year to complete your search. If you do not know exactly what year the event took place, you should enter an approximate year. You can then use the next field to widen your search to a range of years surrounding the approximate year. Year Range (required) - The +- year range option allows you to specify a range of years in which to search. The default option is set to +- 5 years. That means that your search would include results that took place within five years before and five years after the event year you entered. So, if you entered an event year of 1905, you would receive results for records between 1900 and 1910. You can select a year range between 0 and 20 years. We do suggest that you begin with a year range of at least 5 years so that you will be sure to see as many relevant results as possible. It may be that we have a record which differs slightly on the year that the event took place, but which still has valuable information on your ancestor. If you find that you are receiving too many results, you can always try your search again with a more narrow year range. The simple search will include results for records that have no dates if all other search criteria match. However, records that do not include dates will be listed at the bottom of your search results list, so that you see the most relevant results first. If you would prefer to receive only results that include dates, you can use the advanced search by selecting "Advanced Search" from the Search menu at the top of the page. There is an option on the advanced search screen that reads "Include results without dates." This option will be selected by default. To exclude results without dates from your search, un-check this option. Once you have entered your search information into the form, click the Search button to complete your result. If you would like to search using more advanced options, select Advanced Search from the Search menu at the top of the page. You can search using our advanced search options by going to our homepage and selecting Advanced Search from the Search menu at the top of the page. To complete a search, you must enter at least a date range and last name. Search Tips - This button appears in the upper right corner of the search form. You can click it for additional information about how to improve your search results. If you find that you are receiving too many or too few results, you may want to review the Search Tips. Name Variants - This tool allows you to see a list of possible spelling variations for a given last name. Click the Name Variants button. This will cause a smaller window to pop-up. Enter a last name in the "Enter Surname for Variations" field. (If you have already entered a last name into the search form, it should automatically appear in this field.) Then click the Find Spelling Variations button. (Or use the Clear button to clear the field and enter a new surname.) 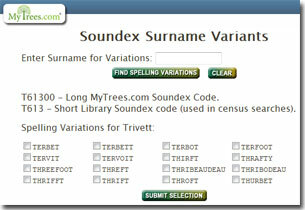 A list of Soundex variations for the surname will appear. Browse the list and click the check box next to any variation you would like to search on. When you are done, click the Submit Selection button at the bottom. That will automatically place those variations in the Last Name field. Event Type - The "Event Type" option allows you to select what type of record you are searching for. The choices are Birth/Christening, Marriage, or Death/Burial. This option is set to Birth/Christening by default, so if you wish to search for a marriage or death record, you will need to select that choice. Middle Initial (optional) - Between the first and last name fields there is a smaller field which you can use to enter a middle initial. This is an optional field, so you can leave it blank. If you choose to enter a middle initial, your results will include records that match the full name (including the middle initial) and also records which match the first and last name, but do not include any middle initial. So, if you were to complete a search for the name "John A Smith", you might see records for "John A Smith" as well as "John Smith." You would not, however, see any results for records that have a middle initial other than the one you entered. Parent/Spouse Names (optional) - These fields are optional. You can enter either parents' names OR a spouse's name, depending on what Event Type you have selected. The ability to include parents' names in your search is available for Birth/Christening and Death/Burial events. You can include a spouse's name when searching for Marriage events. You will notice that either the parent or spouse name fields will be grayed out based on your Event Type choice. In the example to the right, Birth/Christening was selected as the Event Type, so the Spouse name fields are grayed out. When entering parents' names, you have the option to enter a first and last name for both the father and mother. You can complete any of these fields or leave any of them blank. You could, for example, enter only a father's first name. When entering a mother's last name, you should use her maiden name. If you do not know her maiden name, you can enter only her first name. When entering a spouse's name, you can enter both a first and last name or either one by itself. When entering a wife's last name, you should use her maiden name. If you do not know her maiden name, you can enter only her first name. Estimated Event Year (required) - You must enter a year to complete your search. If you do not know exactly what year the event took place, you should enter an approximate year. You can then use the next field to widen your search to a range of years surrounding the approximate year. By default, the search will include results for records that have no dates if all other search criteria match. However, records that do not include dates will be listed at the bottom of your search results list, so that you see the most relevant results first. If you would prefer to receive only results that include dates, un-check the "Include results without dates" option. Database Volume - The Ancestry Archive is divided into different volumes. To view all possible results for the information you have entered, leave this option set to "All". To limit your results, select a specific volume. Our collection Family Tree Names, which have been submitted to us by our patrons, are grouped by the year they were submitted to us. 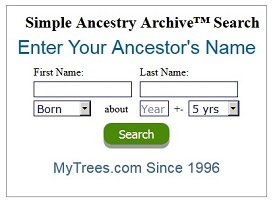 To see only the most recent Family Trees, you can select the current year. The Extracted Volume includes vital records that have been extracted here in our office. Selecting the "Extracted" Volume allows you to search all of these records at once. You can see what extracted records are available, and choose a specific record to search, by going to the Search menu at the top of the page. From there, you will find a group of options titled "Country Extracted Records." Click a country's link to see what records are available for that country. You can select any record from that list to search. The "Internet" Volume contains links to various family pedigrees that have been posted elsewhere on the web. Single Database (optional) - If you only wish to see results from a specific file, you can enter the file name into this field. A file name is a series of numbers and letters that can be found on the results screen, as well as at the top of the file itself. For example, ex123456 or smith1. You would only want to use this field if you have found a specific file that you are interested in and want to search it for a particular name. Include results without dates - This option is selected by default. As long as it is selected, you will see results from records that do not include an event year, but match the name(s) you have entered. (These records will be listed at the bottom of your search results list, so that you see the most relevant results first.) If you would prefer to see only those results that include an event year, you can un-select this option by clicking on the check box. Do NOT search my GEDCOMs - This option will appear only if you are logged into your account and applies only if you have submitted a family tree to us. It is selected by default to prevent your results list from being bogged down with results from your own file. If you would like to see results from your own file, you can un-select this option by clicking on the check box. Do NOT search Extracted records - This option is NOT selected by default. As long as it is NOT selected, you will see results from both our database of Family Tree Names and our Extracted Records. If you find that you are receiving a lot of results extracted records on the site and wish to exclude those from your results, you can do so by selecting this option. Search - This button submits the information you have entered into the search form and will give you a list of all records that match your query. Depending on your search request, it can take a minute for the search to complete so please wait for your Search Results to appear. Simple Search - This link will take you to our Simple Search form, which has fewer search options. If you wish to search using only a name and date, you may wish to use the Simple Search. In this example we are searching for a Robert Trivett, who was born between the years 1880 and 1920. We are searching in all volumes. Edit Search - If you would like to add to or change the information you entered into your search, click on this link. This should cause a search form to pop up in a smaller window. The information from your original search will already be entered into the form. Make any changes that you wish and then click the Search button. That will redo the search and your new results will then display. New Search - Clicking this link will take you back to a blank Ancestry Archive search screen so that you can try a different search. In this example, 10 record matches were found and all 10 are being shown on Page 1. Previous/Next - The Previous and Next links appear both at the top and the bottom of your search results. They allow you to scroll forward or backward through your search results, one page at a time. Up to twenty results will be shown on each page. Result Categories - The information from your search results will be organized into columns by category. You can click on some of these categories to reorganize your results into a different order. For example, if you click on "Updated," your results will be reorganized based on how recently each database was updated. The following table will give you a brief description of each category and will tell you whether you can reorder your results according to that category. Your Results - Next you will see the list of your actual results-those records which matched your search query. You can see some information about the result from the results page itself, including: first and last name, event year and place, and parent or spouse names. If you have access to the collection in which the record is contained, you will be able to view the full record by clicking on the Database Name. Some record collections, such as the Social Security Death Index, are free and can be accessed even without a MyTrees.com account. However, in order to view the full records from our collection of family trees and most of our extracted record collections, you will need to be an active subscriber. If you do not have access to the collection in which that record appears, you will be prompted to either login to an active account or to register a new account and make a payment. Go To Page - If your search returned more than one page of results, you can use this tool to easily move from page to page. Each page will contain up to twenty results. To move to a different page, simply click on the page number. Books and Records: This collection includes a broad range of text extractions. These extractions include vital records such as birth, marriage, death, and census records, as well as extractions from newspapers and family history books. If you have a paid subscription to MyTrees.com, you will be able to view the full records in this database. FamliySearch.org Results: FamilySearch.org is a free genealogy service provided by the Church of Jesus Christ of Latter-day Saints. They also have a wide range of family trees and extracted records. If you click this link on the results page, a smaller window will pop up that takes you directly to a search results page on FamilySearch.org. fold3.com Records: Finally, you will see some links that allow you to search fold3.com records. Fold3.com is a genealogy service that specializes in providing researchers with images of original documents. We have indexes of several of their larger collections, such as the 1930 Census and US Civil War Records, that you can search from our site. The actual images are available, for a small fee, from fold3.com. You can limit the number of results you receive by adding additional information to your search query. If you have been using the Simple Search, try moving to the Advanced Search screen, which gives you additional search options. For example, if you searched on only a surname, go back to the search screen and add a first name. If you are searching on a common name, you may also want to add a parent or spouse name, add a middle initial, or narrow the event year range. Finally, you can narrow your result by selecting a specific Volume to search. Our collection Family Tree Names are grouped in volumes by the year they were submitted to us, so you can search one year at a time. You can also choose to view results only from our Extract Record database, which includes information that has been extracted from vital records, or Internet collection, which includes links to other genealogy websites. If you're getting very few, or no results, you may need to broaden your search query. The ancestor you are searching for may still be listed in our database, but the records we have might not match everything you have listed in your search. If you have included a parent or spouse name in your search, try leaving those fields blank. You might also want to try listing a broader event year range. You can try searching over different spellings for the name. Emphasis on spelling a person's name in a specific way is a fairly modern concept. Your ancestor's first and last names may have been spelled in different ways on various records throughout his or her life. For suggestions on different ways to spell a surname, try clicking on the "Name Variants" button on the Advanced Search screen. You can search on more than one spelling of a surname at the same time by entering them into the "Last Name" field separated by a comma. You can search for different first name spellings by entering only the first two or three characters of a name into the "First Name" field. For example, searching on Rob could return results for Rob, Robby, Robbie, Robin, or Robert. For more information about how and why your ancestor's surname may have been listed under different spellings, see our article What's in a name? Part 2: Your Surname. You can see comprehensive Search Results, which could include parents names or life event dates on the individual, without being logged into an account. However, if you are logged into an account, your searches will automatically be saved in your Recent Searches list (which can be found in the Search menu at the top of the page). That allows you to easily return to the results of a previous search without actually having to do the search again. If you have a subscription with MyTrees.com, you will need to be logged in before you can view the complete files or records in your results. 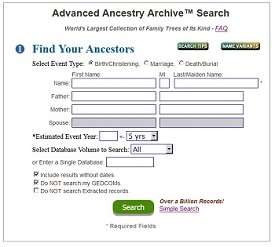 Ancestry Archive - Links in this category allow you to reach the Simple or Advanced Search screens for the Ancestry Archive, or to view your list of Recent Searches. You can also reach the Notify Me service, which allows you to sign up for email notifications when new records are added for your ancestors. General Extracted Records - From here you can find our general Extracted Records search (which searches all of the extracted records at once), a Census Records search (which searches only on our extracted census records), the Social Security Death Index, and Ellis Island search. The Ellis Island records are actually found at http://www.ellisisland.org/, but can be searched from our site. Ancestry Archive Location Search - You can search the records contained in the Ancestry Archive family trees according to location by selecting one of the options in this category. Country Extracted Records - This category allows you to search Extracted Records based on location. Just click on a country name to see what Extracted Records are available for that area. Every Name Search: If you have submitted a file to us, you can use this search to compare every name in your file against our complete database at once. This can save you hours of searching for each name one at a time. Books and Records: This collection includes text extractions from vital records, newspapers, and family history books. Find Living People: Here at MyTrees.com, we specialize in helping our patrons research information on their deceased ancestors. If you are searching for a living individual, this link will take you to a service that will better be able to assist you in that search. Research Interests: From here, you can post a research query. Other researchers can view your query and contact you to share information. You can also search through other researchers' queries to see if you can help or to find others researching similar family lines. Surname Browse: You can use this search to browse through a complete alphabetical list of surnames included in our databases. This can be useful if you are searching for alternate spellings for your ancestor's surname. Top 200 Surnames: This lists includes the top 200 most popular surnames in our databases.